Here we give examples of the use of the words nabi and rasul for non-prophets by the highest Islamic authorities, both ancient and modern. “So when the messenger (rasul) came to him…” (12:50). Rasul here refers to a messenger sent by the king to convey a message to Joseph in prison. “And I am going to send them a present, and see what answer the messengers bring back” (27:35). “O ye messengers (rusul), eat of the good things and do good deeds” (23:51). The word used here for “messengers” is rusul, plural of rasul. In the renowned, classical dictionary of the Quran, the Mufradat of Raghib, it is recorded that “messengers” here, being in the plural, means the Holy Prophet Muhammad and his chief Companions. In Sura Yasin of the Quran, there is a story of three messengers being sent to a town, who said to the people: “We are messengers to you” (36:13-21). Renowned commentators of the Quran have held that these three were not real messengers, but only saints who are called mursal here metaphorically. 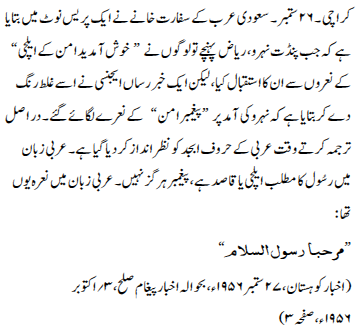 (Abqaat, Urdu translation by Manazir Ahsan Gilani, published in A.P., India, p. 402). This verse mentions messengers and prophets (rasul and nabi) and states that their revelation is protected by Allah against the interference of the devil. The meaning is that the mention of messenger and prophet in this verse includes muhaddas as well, and the verse amounts to saying: “no messenger and no prophet and no muhaddas”. ‘Umdat al-Qari, a commentary on Bukhari, ch. Qualities of Umar. Shah Waliullah of Delhi. See his book Al-Khair al-Kasir, Fifth Khizana (see p. 97 of its English translation, published by Ashraf, Lahore, 1974). — Book: Expeditions (Maghāzī), hadith number 4418. Here a messenger sent by the Holy Prophet is described as his rasul. — Book: Call to Prayer (Adhān), hadith number 687. Again a messenger sent by the Holy Prophet is called a rasul. — Book: Excellences of the Companions (Faḍā’il Aṣḥāb), hadith number 3696. Here a messenger sent by a Muslim ruler is called a rasul. — Book: Commentary on the Quran, in explanation of 26:214, hadith number 4770. Evidently, each of these observers sent by the clans, who is called a rasul, was an unbeliever. “When the Messenger of Allah decided to send Mu‘adh (ibn Jabal) to Yaman (as Governor), he asked him how he would decide cases. Mu‘adh replied: ‘By the Book of Allah’. He asked: ‘But if you do not find (any direction) in it’. He replied: ‘Then by the practice (Sunnah) of the Messenger of Allah’. ‘But if you do not find (any direction) in the Sunnah’, he asked. ‘Then I will exercise my judgment and spare no effort’, Mu‘adh replied. — Abu Dawud, book: Office of the Judge (al-aqḍiyah), ch. 11, hadith number 3592. Here the Holy Prophet himself has described a Companion, whom he is sending, as rasul of the rasul of Allah. Here the word rusul is applied to those who brought a message of reform for Islam (i.e., removing un-Islamic beliefs prevalent among the Muslims, and restoring the original teachings of Islam). (Daily Kohistan, Pakistan, 27 September 1956; quoted from Paigham Sulh, 3 October 1956, p. 3). Paighambar is the Urdu and Persian word applied to messengers of Allah, such as Moses, Jesus and the Holy Prophet Muhammad. This press note is clarifying that the description of Nehru as rasul in this slogan does not mean that he is being called a messenger in the way that the prophets were called messengers, but that the word rasul here only meant an envoy or emissary who was bringing a message of peace. He has thus applied the word ‘prophet’ to Hazrat Abu Bakr and Umar, who were not prophets. We give below the opinion of three modern-day Muslim theologians on these verses. “In the path of virtue be anxious to serve humanity, so that you may attain prophethood within the Muslim nation. We only ask Allama Khalid Mahmud to apply the same “rules of knowledge and integrity” when studying the writings of Hazrat Mirza Ghulam Ahmad, and not interpret them “contrary to the intent of the author”! ‘The exaggeration in likening a saint to a prophet refers to the penetrating effect of his guidance; otherwise, at no time was prophethood thinkable after the Holy Prophet Muhammad.’— Masnawi, vol. v, p. 67, footnote 13, printed at Kanpur. The words Had Moses been alive he would have obeyed me are a Saying of the Holy Prophet Muhammad. He was the mujaddid of his time and the saint who laid the foundations of the propagation of Islam in India. “No one knows the secret that the believer, apparently only reciting the Quran, is in reality the Quran. The world is a house of idols, and the man of truth is Khalīl (i.e., Abraham); this is the idea which lies concealed in la ilaha (There is no god but Allah). The true believer strikes like lightening from the sky, his fuel is the cities and uninhabited areas of east and west. We are as yet enveloped in the darkness of creation, but he takes part in running the world. Transliteration is nabī and rasūl. Transliteration is muḥaddathiyyat and muḥaddath. Transliteration is Kalīm, Masīḥ, and Khalīl.